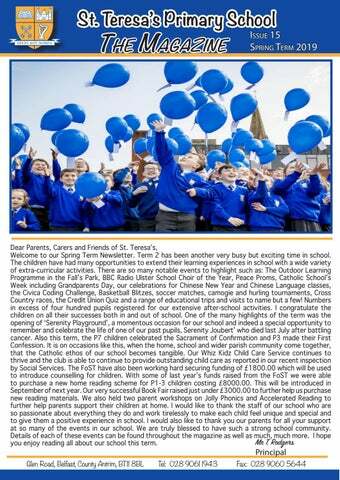 Dear Parents, Carers and Friends of St. Teresa’s, Welcome to our Spring Term Newsletter. Term 2 has been another very busy but exciting time in school. The children have had many opportunities to extend their learning experiences in school with a wide variety of extra-curricular activities. There are so many notable events to highlight such as: The Outdoor Learning Programme in the Fall’s Park, BBC Radio Ulster School Choir of the Year, Peace Proms, Catholic School’s Week including Grandparents Day, our celebrations for Chinese New Year and Chinese Language classes, the Civica Coding Challenge, Basketball Blitzes, soccer matches, camogie and hurling tournaments, Cross Country races, the Credit Union Quiz and a range of educational trips and visits to name but a few! Numbers in excess of four hundred pupils registered for our extensive after-school activities. I congratulate the children on all their successes both in and out of school. One of the many highlights of the term was the opening of ‘Serenity Playground’, a momentous occasion for our school and indeed a special opportunity to remember and celebrate the life of one of our past pupils, Serenity Joubert’ who died last July after battling cancer. Also this term, the P7 children celebrated the Sacrament of Confirmation and P3 made their First Confession. It is on occasions like this, when the home, school and wider parish community come together, that the Catholic ethos of our school becomes tangible. Our Whiz Kidz Child Care Service continues to thrive and the club is able to continue to provide outstanding child care as reported in our recent inspection by Social Services. The FoST have also been working hard securing funding of £1800.00 which will be used to introduce counselling for children. With some of last year’s funds raised from the FoST we were able to purchase a new home reading scheme for P1-3 children costing £8000.00. This will be introduced in September of next year. Our very successful Book Fair raised just under £3000.00 to further help us purchase new reading materials. We also held two parent workshops on Jolly Phonics and Accelerated Reading to further help parents support their children at home. I would like to thank the staff of our school who are so passionate about everything they do and work tirelessly to make each child feel unique and special and to give them a positive experience in school. I would also like to thank you our parents for all your support at so many of the events in our school. We are truly blessed to have such a strong school community. Details of each of these events can be found throughout the magazine as well as much, much more. I hope Mr T. Rodgers you enjoy reading all about our school this term. SERENITY PLAYGROUND St Teresa’s Primary School on the Glen Road in Belfast, held their official opening of their new state of the art playground on Tuesday 9th April. ‘Serenity Playground’ as it has been named was officially opened by the Lord Mayor, Councillor Deirdre Hargey. The playground was funded by the Department of Communities at a cost of over £250,000. What made this day very poignant was it had been dedicated in memory of Serenity Joubert, one of our P6 pupils who sadly died last July after battling cancer. Serenity was so excited to learn that St Teresa’s was going to have such a wonderful new play space and was very much looking forward to this day. It is very sad that she can’t be here to enjoy it but we are delighted that each time the children enjoy this fabulous new playground that they will think of Serenity with a smile. Serenity’s family were able to attend the event which made the occasion very special. The Rev Fr Brendan Hickland was also there to bless the new facility. The new playground has made such a huge impact on the play experience for the children in our school in terms of the quality of their play, health and wellbeing and ensuring it is fully inclusive of all of the children in our school. We would like to thank the Department of Communities, the Education Authority and all those who helped make the playground a reality. SACRAMENTAL SERVICES THE LOST SHEEP PRAYER SERVICE On Thursday 12th February Primary 3 children took part in the Lost Sheep Prayer Service. Throughout this service the children showed a great understanding and knowledge of the Parable of ‘The Lost Sheep’. Let’s not forget their great acting skills and beautiful singing. The children really enjoyed this service and teachers and parents alike were very proud. Fr Aloysius was really impressed with the maturity, understand and skills the children portrayed. Well done P3! On Thursday 14th March our P3 pupils received the sacrament of First Confession in St.Teresa of Avila Church. The pupils impressed everyone with their beautiful singing, their knowledge of their prayers and their ability to reflect and show respect within the church. They prepared for the sacrament with great reverence and everyone was impressed with their knowledge and understanding of the commitment they were making. Fr Aloysios and the other priests made the day very special for all the boys and girls. The Primary 3 teachers would like to acknowledge how proud they are of all the children and hope they remember this special day in their faith journey. SACRAMENTAL SERVICES SERVICE OF LIGHT The Service of Light was held on Thursday 24th January in the Church of St.Teresa of Avila. This was the final service of preparation for the P7 pupils prior to their Confirmation. It was a beautiful ceremony, during which the parents hand a candle, which has been lit from the Paschal candle, to their child. This special moment is a sign of the faith that they are passing on to their child and a sign of the help and support they will give them as they live out this faith in their lives. Beautiful singing and readings, as well as very reverent behaviour from pupils made this ceremony, in a church illuminated by candlelight, a very special and memorable occasion for all. CONFIRMATION On Thursday 14th our P7 pupils received the sacrament of Confirmation in St. Teresa of Avila’s Church. This was a wonderful occasion, the boys and girls impressed everyone with their very respectful performance on the day. They prepared for the sacrament with great reverence and everyone was impressed with their knowledge and understanding of the commitment they were making. Fr McGuckian, Fr Brendan and Fr. Aloysius made the day very special for all the boys and girls. The ceremony was beautiful and the children who read and sang were a credit to the school and their families. Mr Rodger’s singing wasn’t too bad either!!! As P7 teachers we were extremely proud of all the children and we hope it will be remembered by them all as a very special event in their last year in St. Teresa’s. CATHOLIC SCHOOL’S WEEK 2019 On Monday 28th January, Miss Mooney’s P4 class participated in an Assembly to mark the beginning of Catholic Schools Week 2019. The theme of Catholic Schools Week this year was, ‘Catholic Schools: Celebrating the Work of our Local Catholic Schools’. This was a meaningful start for their preparation for First Holy Communion. Then on Wednesday 30th January there were smiles all around when the P3 children’s grandparents came to school for a special prayer service which included songs, readings and prayers made and read by the children for their grandparents. It was a very moving celebration and thoroughly enjoyed by grandparents, children and teachers alike. It is a special memory that these Primary 3 children will always have – a day when they almost burst with pride with the love they felt for their very special grandparents! The children in Key Stage 2 attended the Parish 10am Mass in St Teresa of Avila Church during this week and there were also periods of reflection on the theme of Catholic Schools Week in all classes. The children in Miss O’Rourke’s P2 Class concluded the week with a closing assembly and remembered St Brigid in a special way who’s feast day was the same day! Catholic Schools Week was a really great week of celebration in our school! PRIMARY 3 CELEBRATE GRANDPARENT’S DAY On Wednesday 30th January, Primary 3 children celebrated Grandparent’s Day as part of Catholic School’s Week. Primary 3 delivered a beautiful prayer service for their grandparents with drama, song and artwork. The children showed an excellent understanding of how the love we have for our parents and grandparents reflects the love we have for God. Well done to the boys and girls for such wonderful kindness. Wednesday 6th March 2019 was Ash Wednesday. In our School we had two short prayer services; one for Foundation Stage/Key Stage One and one for Key Stage Two which were led by Miss Cullen and some children from P4A who talked to us about Ash Wednesday. We listened to the boys and girls and sang and prayed together. We received ashes on our foreheads to mark the beginning of Lent. The boys and girls in Primary 7 attended an RSE workshop on Tuesday 5th March called ‘What’s inside?’ The Down and Connor Catholic Schools Support Service organised this workshop for the P7 children and their teachers. It was devised around the area of relationships and sexual education to explore the theme of relationships through drama, prayer and fun activities, all of which have morals and corresponding values. ICT IN ST TERESA’S SAFER INTERNET DAY 2019 The theme of Safer Internet Day on 5th February 2019 was ‘Our Internet, Our Choice’. All children during this week participated in class discussions and watched short programs to raise awareness of digital safety. In addition, the children participated in whole school assemblies. The focus during these assemblies was to raise awareness of pupils need to give and ask for consent. Asking permission to access the internet, to take and allow photographs of themselves and to make positive choices when online. Please help us ensure your child’s safety by reinforcing the message of making good choices. SAFTER INTERNET DAY 2019 and CEOP are two great websites for more information in how to help your child stay safe online. SPHERO CODING CHALLENGE Primary 7 participated in a Sphero Coding challenge this term. This event is co-ordinated and hosted by CIVICA , a local based Software Engineering company. The children had workshops to problem solve and develop their programming skills. They were then tasked with creating a maze and programming a small robot called ‘Sphero’ to navigate through their creation. All pupils thoroughly enjoyed the experience, which developed their team building, problem solving and coding skills. The CEO of Civica who came along to judge the final mazes was very impressed with the high standard of learning demonstrated by our P7 children. STUDENT/ECO COUNCIL STUDENT COUNCIL This term the student council were busy looking into the development of our school. We evaluated parts of our school development plan and had our own input on how to help things move forward from a child’s perspective. We were also busy helping the classes of the school come up with their own fundraising initiatives for this year’s Trocaire Lenten campaign. We have also discussed and voted on an event we would like to rerun again in Term 3. Watch this space! ECO COUNCIL The eco team are currently working on three main topics: litter, healthy living and globalisation. We are discovering the effects of plastic in our global environment and working to reduce the amount of plastic that we use. We are doing this through auditing, monitoring and analysing different plastics that come into our school environment. We are also considering what happens to these plastics after use. Also for the first time in St. Teresa’s we have a junior eco team. Here is a picture of our newly established junior eco team with Odhran and Josh, our chairperson and deputy chairperson of our eco team. PRIMARY 7 BUN SALE The Primary 7 boys and girls have been busy trying to raise money for costumes and props for their end of year show ‘The Wizard of Oz’. They held a bun and cake sale and raised an amazing £950. This will be a show not to be missed! SCIENCE SUPERSTARS CCEA SCIENCE PHOTO SHOOT We hosted a photo-shoot in March for CCEA, the Curriculum, Examinations and Assessment Council. These photographs will help provide practical guidance for teachers in all other schools in Northern Ireland about progression in science activities from P1 to P7. The children had a lot of fun and really enjoyed the experience. PRIMARY 5 AT THE ULSTER MUSEUM On 4th April, Primary Five were lucky enough to visit the Tim Peake’s Spacecraft Exhibition at the Ulster Transport Museum. In class, the children had learned all about Tim Peake’s mission to the international space-station and so it was incredible to view the actual Soyuz capsule, which transported him safely back to Earth in June 2016. We had the opportunity to get up close to the capsule and see the fully-equipped interior, as well as the char marks on the exterior which showed the result of the impact of the Earth’s atmosphere on the spacecraft during its descent from space. One of the highlights was definitely stepping inside Tim Peake’s Sokol KV-2 emergency spacesuit and we really enjoyed all the interactive displays about the International Space Station. Maybe someday some of us will follow in the footsteps of Tim Peake and journey to space ourselves! SCIENCE SUPERSTARS GO FLY YOUR KITE - PRIMARY 5 MISS MCKEE There was great excitement in Primary Five A when Miss McKee announced the news that the class had won a free science workshop called, ‘Go Fly your Kite,’ organised by the EBS Science Blast organisation. The class are busy preparing their own project to showcase at the Science Blast show in the Waterfront hall in June, so this was a great opportunity to help us think of some ideas. We gathered in the hall and were greeted by George from the Go Fly your Kite team. He had decorated the hall with beautiful kites, and we couldn’t believe it when he told us we were each going to design, construct and of course fly our very own kite! First, we learned a little about the history of flight before the design process began. We were so proud of our beautiful kites! When the construction process was finished, the real fun was about to start! We took our kites outside into the beautiful sunshine and had listened to George’s top tips for successful kite flying. We each got to take our kites home and look forward to teaching our families how to fly them. Maybe you might see them in the sky above the Glen Road! The Primary 7 boys and girls took part in a STEM challenge which was hosted by St Dominic’s High School. Well done to all the boys and girls who scored very highly in the challenge! St. Teresa’s enjoyed celebrating Chinese new year. The whole school was treated to a very special assembly learning about Chinese traditions and hearing and seeing beautiful singing and dancing from Miss Wang and her friends. The children learned about Chinese musical instruments, the Peking Opera and Bamboo Flute. The children participated in workshops where they dressed in traditional Chinese dress, experienced bracelet making and writing Chinese calligraphy. The children really enjoyed the celebrations and all dressed in red for the occasion! After Schoolâ&#x20AC;&#x2122;s Club This has been another successful term for our Afterschoolâ&#x20AC;&#x2122;s Clubs, over 330 Children have participated in the Extended Schools Programme this term. The Primary 1 Children were able to take part in the Extended Schools Programme for the first time, which has been great for helping to build their confidence and develop new friendships. The children thoroughly enjoyed participating in their clubs. Once again the Sewing Club turned out beautiful pieces of work which can be seen on display in the School Foyer. We look forward to another successful Extended Schools Programme starting in May 2019. GARDENING CLUB Gardening Club have been working hard so far this year. They have been helping to develop the new Fairy Garden which should be ready in Term 3. The children have been digging holes to set the benches in. They also built a bug hotel, the pupils used drills and other tools, which was very exciting. We have also planted lots of vegetables, including onions, garlic, kale, brussel sprouts and turnips. The gardening club pupils recently replanted all the flower beds in the school. It has been another very busy term for Gardening Club but they have all had a great time. Keep up the hard work boys and girls. World Book Day 2019 Reading and Writing are vital skills for children. In St Teresa’s we work hard to develop these skills in the children. The Travelling Book Fair was in school from Monday 4th March and was an amazing success raising the greatest amount of funds for our school to date. The fair raised a staggering £2890.00 60% of which can be used to purchase reading materials for the children of our school. Children were also invited to dress-up as their favourite book character on ‘World Book Day’ on Thursday 7th March this year. The children and staff were once again very creative in their costumes reflecting a wide variety of books. We were also delighted to welcome Mr Kieron Black, a prominent local author who carried out a number of workshops to demonstrate how books are created and illustrations made. This was very exciting and inspirational for the children. Each class also celebrated World Book Day in their own unique way ensuring that children see reading and books as something to celebrate! Remarkable Readers The Primary 2 children were very lucky to have a visit from author Kieron Black to our school this term. The children had the opportunity to listen to one of the books that Kieron has written. After the story, there was a chance for the boys and girls to become illustrators for the afternoon by following Kieron’s top drawing tips. The children thoroughly enjoyed this experience and all of the classes in the school were given a signed copy of Kieron’s book ‘The Goblin’s Blue Blanket’.Thank you Kieron for coming to visit P2. We had a great time! Accelerated Reading has now been successfully in operation in St Teresa’s for two years now. On Tuesday 16th April, we held a parent workshop to ensure that parents had the opportunity to fully understand the programme, how it works and how it supports children’s independent reading. The workshop, which was led by Mr McCaughey and Mr Rodgers, was a great success with very positive feedback from the parents that attended the event. We hope that with parental support, children’s reading will continue to grow from strength to strength. Congratulations to our Credit Union Quiz teams who came both First AND second in this year’s heats competition! The children proceeded to the next round and were tasked with answering challenging questions. We were proud with how well they represented our school and we were some impressed with their knowledge of all areas of pop culture and general knowledge. Well Done! In the same competition as the camogie team, the hurlers also excelled. We were grouped with St Therese of Lisieux, Bunscoil Phobal Feirste and St Michael’s which was always going to be a tough task. Our boys managed to win two out of their three games after being narrowly defeated by a single goal to the Bunscoil. Darren Delander and Jude Mallon were instrumental in midfield, tallying 11 goals between them with their storming runs from the centre. Kevin Wilson did a great job up front scoring a couple as well. We have a lot of talent in our school on the hurling front and it would be great to see some new faces at our training sessions. This Term P5 each got the chance to take part in Basketball Blitz in Queens PEC. Here the classes got to compete against other schools and show off all the skills they have been developing with the basketball coaches within P.E. With; •P5A coming 3rd overall and Shay Hillock winning the numbers game. •P5B winning the runners up trophy at the Basketball Blitz. •P5C winning a trophy for coming second place against St Joseph’s Primary. Well Done Team P5. PRIMARY 7 ALTHETICS This term, P7A and P7B had the opportunity to take part in the athletics championship in Ballysillan Leisure Centre after having 4 weeks of training from athletic coaches. Their hard work and determination paid off as St Teresa’s won the mixed relay race! Term 2 saw our school football team compete in some fantastic games and competitions. First up was a NI School’s Quarter Final against St Michael’s Primary School. Coming up against one of the favourites of the competition was always going to be a stern test but our boys passed it with flying colours. Rhys Meenan’s ferocious long range volley and some resolute defending was enough to ensure our passage to the semi-final stages were we were eventually eliminated by an exceptionally strong Holy Cross Boys’ team. Mark Vernon deserves a special mention for some of the stunning saves he made on the day. We had good success in the Shankill Leisure Centre indoor tournament as well with the boys coming third in their group overall and Mark Vernon excelling in a rare outfield role scoring 3 goals on the day. We then had two football festivals to play in against other similar ranked teams. The boys have progressed to a higher division this term and didn’t look out of place at all against some very stiff competition. We had good results against Holy Evangelist and should have been given all 3 points against Stranmillis but luck wasn’t on our side. Some excellent performances from all the boys but particularly Thomas Meenan who scored a fantastic goal against Ballyhackamore. Well done to the boys for putting in a tremendous effort this year! FIND A SPORT’S STAR P6A had an amazing opportunity to take part in this years, ‘Find A Sports Star’ event at the White Rock Leisure Centre organised by Belfast City Council. The children had an opportunity to try new sporting activities such as Judo, fencing, tennis, cricket, athletics and gymnastics. The children really enjoyed these activities and it was an all-round fun experience. This term in our Speech and Language Centre our P3-4 class were finding out about our “Playing in the Park” friends for PDMU. Jay Cush created some beautiful drawings of the characters. Our P1-2 class enjoyed planting sunflower seeds and watching caterpillars turn into butterflies. The SLC staff received training from our Speech Therapists in the area of expressive language. The speech therapists came into the classroom to demonstrate activities and to support teaching staff with this. In Term 2 the P1 children really enjoyed this very unique and memorable dance experience. The sessions provided opportunities for a fun- filled interactive experience for all the children. Each week the facilitator brought along a range of items like pom-poms, sticks, ribbons, dusters and shapes. The children moved with these to music and had a lot of fun! We loved moving, stretching, thinking, exercising and keeping fit! PRIMARY 6 MUSIC MORNING This term, P6B took part in the “Music Makers Morning” organised by the City of Belfast School of Music. The children had to learn lots of songs and played a range of percussion instruments to accompany the songs. As part of the morning they also had to compose their own music to represent a trip to Space. The boys and girls had a great time experimenting with different sounds to represent all the different planets. We performed the composition in front of 3 other schools and sang songs with the other children. It was a great experience and the boys and girls worked very hard to learn all their music. We all had a wonderful time! ST MARY’S UNIVERSITY HALIFAX, CANADA VISIT On Friday 15th February we were delighted to once again welcome back to St Teresa’s, the students and staff from St Mary’s University in Halifax Canada. The University partnered with St Teresa’s, after learning of our pioneering work on developing tolerance and respect through our ‘Media Initiative Programme’, which uses puppets and storytelling to help children recognise and celebrate difference in each other. The students, visited classes and further developed the theme of conflict resolution. 3. Others have the right to feel safe with us. The teachers plan on sharing the training with other members of staff. The Key Stage 2 pupils will be receiving a beautiful booklet on emotions and how to stay safe. We are hoping that this will benefit some of the pupils in our school. HMRC VISIT TO PRIMARY 7 The children in P7 were learning about Financial Capability with staff from HMRC as part of their learning in Maths this half term! They were covering all aspects of Tax, Profit and Loss, Balances, Credit and Debit. If you need any help with budgeting, you know who to ask for help! WORLD WAR 2 WORKSHOP - PRIMARY 4 The children in Primary 4 enjoyed a World War 2 workshop with a visit from the War Memorial Museum. Stories were shared about Belfast in World War 2 and the part our city played in this historic event. Primary 4 children got the chance to see real life World War 2 artefacts such as gas masks, identity cards and replica shells. The children were also shown real life World War 2 uniforms including; a Pilot, a Nurse, an Air Raid Warden and a Soldier. The children were given the opportunity to try on these uniforms which really brought the topic to life! News From Around The School PEACE PLAYERS The classes of P6C and P7C participated in Peace Players this term. This is a great cross community programme where children had the opportunity to talk and share ideas on diversity as well as engaging in fun basketball activities with the Peace Players basketball team. OUTDOOR LEARNING IN FALLâ&#x20AC;&#x2122;S PARK The boys and girls in Primary 1 enjoyed their trips to Fallâ&#x20AC;&#x2122;s Park this term to engage in outdoor learning activities. The children looked for signs of spring and enjoyed a hot chocolate around the campfire to warm themselves up! Whilst walking around the park on their adventure, the children spotted swans, ducks and geese swimming in the lake. They also had the opportunity to plant some seeds. what an amazing experience for the P1 children! The Board of Governors, Principal and staff wish you all a peaceful and relaxing Easter! Welcome to our Spring Term Newsletter. Term 2 has been another very busy but exciting time in school.